In simple words, responsive web design is an approach to website development in which websites are created in such a way that they can be viewed from any device, regardless of screen size, whether it is a desktop computer, mobile phone or tablet. There are many advantages of responsive websites and its uses are increasing with each passing day. So, web developers and have started to create websites with a mobile-first approach. 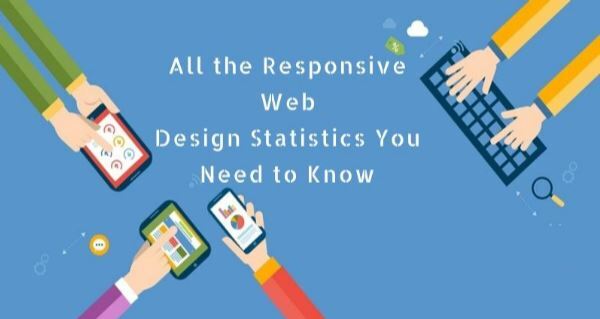 Today, we will know about some impressive statistics about Responsive Web Design. So, let’s start the journey. Gone are the days when people used to sit before computers for several hours to browse the web, read the desired content, and complete various actions. These days, nobody likes to waste his/her several hours just to browse the internet on a PC. A lot of people, for different reasons, more from one place to another and they like to keep enjoying the luxury of the Internet at all times. This tendency has resulted in a sharp increase in the use of different mobile devices for the Internet. So, the number of Mobile Internet users are skyrocketing with each passing day in different parts of the world. Despite the increasing popularity of different social media websites and Instant Mobile Chatting Applications, Emails are still popular. Around 51% of all Emails are opened on different mobile devices. A significant number of web-based companies are involved in Email marketing efforts. So, always keep in mind that anyone who periodically reads mail on mobile devices can experience both quite enjoyable or awful moments. For experienced web designers, it is always easier to create newsletters for mobile devices. However, mobile and regular versions of newsletters may differ significantly from each other in terms of content, functionality, navigation. If you manage to beautifully enter the category tree into the standard distribution, it doesn’t mean that your emails will be adaptable to the mobile devices. So, keep the navigation of your newsletters simple, straightforward and clean-cut. You should make up the mobile version of the mailing in one column as this will ensure that the message is easy to read when viewed on a device that is oriented vertically. Make sure that your content is placed in two or three columns with some simplifications and abbreviations at one place. It will make your newsletters look more professional and user-friendly. Gone are the days when people used to visit brick and mortar shops to buy products and services. Offline shopping is financially costly, involves a lot of bargaining, traveling from one place to another, and has time restrictions. So, most mobile phone users flock to online shopping which is far more convenient compared to offline shopping. Most mobile phone owners buy new products online. 48% of them use different search engines for online shopping. So, by creating feature-rich E-commerce websites and optimizing them with a mobile-first approach, you can get tremendous success in the rapidly booming E-commerce business easily and effortlessly. Always keep in mind that millions of Mobile Internet users look for products on different E-commerce websites and make instant decisions. Recently, Chinese E-commerce giant Alibaba sold a record number of products worth 30.8 billion in just 24 hours. It is because Alibaba primarily focuses on sales coming from the small screens. It is believed that nearly 70% of all mobile users take the desired actions in just one hour. It is a remarkable figure, which shows that E-commerce companies make massive revenues easily by focusing on Mobile Internet users. America is a leading country when it comes to online shopping. In the USA, the most developed country on the earth by all parameters, 50% of all people use different mobile devices to buy the desired products online from various E-commerce websites. This is an impressive figure if you aim to launch an E-commerce business in the USA and sell products people are crazy about. Mobile Internet browsing has now become the order of the day. Almost all tech-savvy people browse websites through mobile devices. These are some impressive figures that show the importance of website design with a mobile-first approach. Create responsive websites and rule the web! Good Luck.